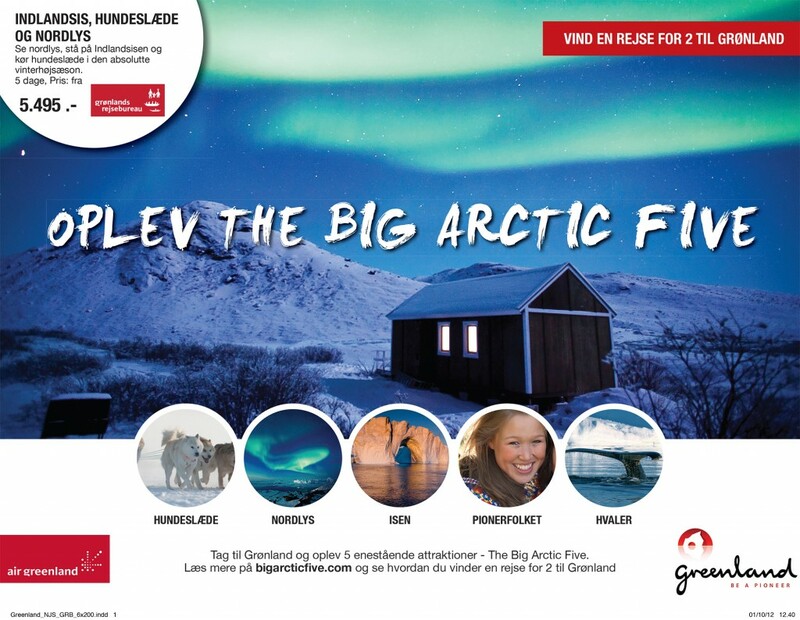 As mentioned, The Big Arctic Five concept had a very positive reception in the autumn campaign in Denmark and we will also use The Big Arctic Five to market Greenland internationally. You can get a share of this attention that there will be on The Big Arctic Five concept by staging your product within the framework and by using the concept in your own marketing (on your website, in your brochures, etc.). If, for example, you offer one (or more) of the five Big Arctic Five elements, use the tools here to show it and explain why people should come and experience it with you in particular. We provide you with the tools in this toolbox that you can use to market your product in The Big Arctic Five framework. Some of the materials are fixed elements, others you can customize to suit your particular product. The following are just examples of how the concept can be expressed.  It is then up to you to customize it to your region, your company or your product. Example 1 is a newspaper ad that was created for the campaign in the autumn. A characteristic element of The Big Arctic Five campaign material are the five circles with photos that stand side-by-side at the bottom. It gives a quick overview of the five elements/experiences. In addition, ‘The Big Arctic Five’ title is written in pioneer brush font. We have also made ​​some combinations of these elements that you can use depending on the media, as well as how it fits with your product, i.e. whether you offer all The Big Arctic Five or simply want to show that you offer an element of The Big Arctic Five. Example 2 is The Big Arctic Five campaign website that again contains the five circles and the title. If you click into the site you will see how we used The Big Arctic Five photo and video material that you can also download here. We used it as full page background photos and videos. Example 3 shows the travel deals page on the campaign website, where you can see how you can use The Big Arctic Five at product level on a specific travel deal. 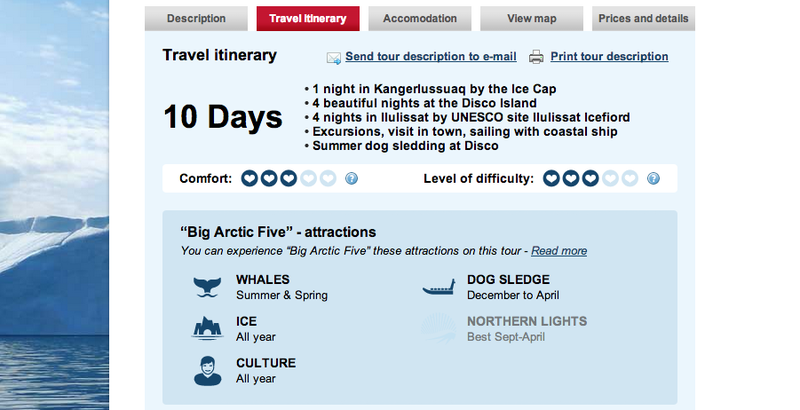 The four icons on the first travel deal indicate that this package tour contains three out of the five Big Arctic Five. 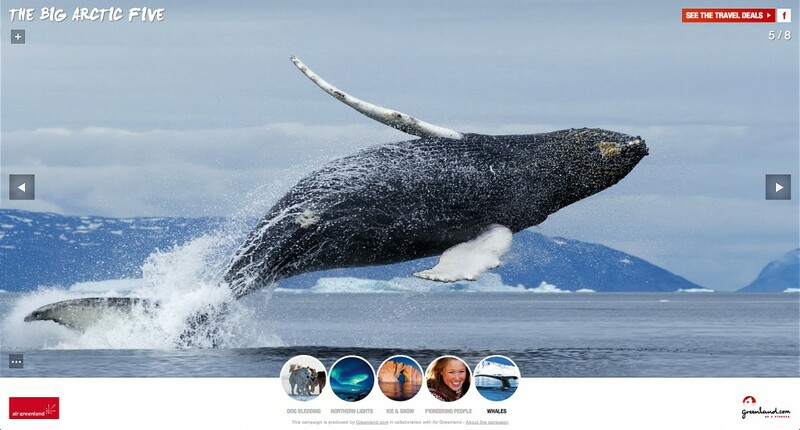 Example 4 shows how a travel agent has chosen to use The Big Arctic Five concept to market their products by highlighting the four components that the offer includes and downplaying the last (icon).